The Ambassador Hotel is situated in Hurghada, 5 minutes from Hurghada international Airport, just minutes from the beach and 10 minutes from the down town. It’s ideal for both business and pleasure. All spacious suites are fully equipped with balcony, separate living room, sofa, satellite television, mini bar, air condition, and telephone. The hotel amenities include a fantastic swimming pool for adults and another for children, restaurant, bar, patio, and transfer from the hotel to the beach. Guest rooms at the Ambassador Club Hotel offer air conditioning, private bathroom with shower or bath tub, satellite or cable TV, telephone and either a terrace or balcony. 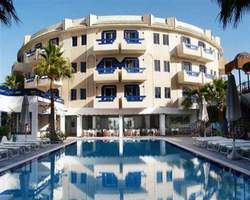 Facilities on offer at the Ambassador Club Hotel include a swimming pool for adults and another for children, restaurant, patio and transfers from the hotel to the beach. shops bars and restaurants can be found nearby. Water sports are available on the beach.